Enjoy huge, panoramic views of Surf and Sand throughout this open and spacious home. Great Whale Watching, Sunsets and Wild surf storms from this 3 bed, 3 bath. Upscale, romantic king master, 2nd king bedroom, 3rd queen bedroom also with unobstructed ocean views & queen hide-a-bed. Please avoid leaving a "Single Night Gap" June- Sept & Spring Break. Summer 2019 (July & Aug) 5 nt minimum unless filling a gap. "The house was immaculate and in great shape. Outstanding views, too; some of the best we've had on the Oregon Coast. Location is great for tidepools, yet the beaches aren't crowded because the house is a bit off the beaten path. No stairs to beach, but it's just a two-minute drive in either direction for beach access." "On our annual trip to Oregon we had the opportunity to stay at Pacific Escape. The property was more than we could have asked for. We were somewhat hesitant renting a property in Lincoln City (do to the traffic) but this property is located right on the beach and out of the way of congestion. The house itself was fabulous - plenty of room, entire backside of home overlooks the Pacific Ocean, beautifully appointed, all three bedrooms spacious with comfortable beds - it was just great. We will rent this property again." "We enjoyed the home, great views. It was nice because I took my son and two daughters and their spouses and we all had a good time! Can't wait to do it again. It was the first time I had rented a home." "Overall a good experience. This rental, however, came with VERY limited amenities. There were not enough bath towels. There was only one roll of toilet paper, no garbage bags, not enough routine cleaning supplies (e.g., dish soap, sponge, paper towels), and the cooking supplies had missing pieces (e.g., no frying pan, not enough knives). Recommend factoring in some costs for a hefty store run." "A wonderful experience. A beautiful view, nice home, very comfortable. Close to the beach. We hope to return in the future. " "We had a wonderful vacation. The house was well equipped , cozy and had awesome views. I would return again without hesitation. " "Our family had checked into another rental property & were very dissatisfied. Called the number posted in the Kitchen. Karen immediately set us up to check into Pacific Escape. Nice view, spacious and well equipped kitchen. Thank you Karen for saving our family vacation!" "We have stayed in A-1 Beach Rental Homes before. Pacific Escape is our favorite so far. It is well appointed, and a good lookin' home with plenty of space. Most importantly, the beds are comfortable. Was Disappointed with the inch thick of dust on the paddle fan blades in Master Bedroom though. And, the Hottub has every jet but one not in operation which was disappointing considering there were reviews that said the same thing about it several months before. Also, theres no access allowed through the front door of home. Im sure they have a reason for but would have preferred access there. All in all, it was a great trip with plenty of happy campers. The view is amazing, and the staff seems to be very kind and accomodating. Would stay here again. " "We booked in October for a conference. The main reasons why you book a beach house on the water with a hot tub in October is for the hot tub. Unfortunately, the heater in ours didn't work and we couldn't use it Friday night or Saturday morning. Not the end of the world. Give me a good apology and a discount and we are fine. I felt like management was more interested in telling me I was screwed under the contract than working with me. The other issue was no tiny shampoos so I had to wash my hair with soap. Rest was quite nice. Good price. Accurate photos. On a cliff but closest house to the beach. Walk to beach is very close. " "I have had another spectacular stay at Pacific Escape. Usually go with girl friends, went with hubby and couples this time. Everyone loved it. The kitchen and living room areas are always a pleasure. Well appointed. The beds are comfy and nice. Really enjoyed the hot tub again. " "This was our 5th annual trip with 2 other couples, loved the home. The view was amazing and even better from the master. Loved the hot tub, only wished there were stairs down to the beach. The group vote was that we will be back next year. " "We very well pleased with our experience during our stay. The unobstructed view of the Pacific Ocean from the elevated situation was breath taking. We saw whales and sea lions from the vantage. Sitting in the spa under a star lit sky with the sound of the surf cannot be described with words. The entertaining and sleeping accommodations are also awesome. Decor, space, and light are all exceptional. The staff performed above and beyond our expectations in order to provide a great experience for our stay. We were entertaining family from the East Coast and I think we made them envious of this beautiful part of the world. The Pacific Escape played no small part in that. " "The first day we found a glass ball on the beach! In plain sight! The weather was good. The house was very relaxing. " "The home itself is very nice; nice decor, comfortable furniture, well stocked kitchen for almost every cooking need (they could use more matching plates for large groups). And when we had an issue with the garbage disposal, the people at A-1 were friendly and helpful and got someone out there the same day. That being said, I wouldn't recommend it for those with elderly who can't do stairs. The front door is inaccessible (the owner has since lost the key) so the only options are 2 flights from the garage or to pull up to the front door and allow them to walk around the back porch into the kitchen. So while we loved the house, that part was inconvenient for us so we'll have to find a place that either far fewer stairs or a usable front door. But really the house itself is wonderful and the A-1 staff a pleasure to deal with!" "The property is fantastic, hot tubbing on the deck in a winter storm was really cool. Upstairs fireplace and jaccuzi tub weren't working, but that was no big deal." "This was our 3rd year at this house for our annual girl weekend (15th year overall!!). It is so comfortable and clean. We love all the spaces, and the views are amazing. We can't wait for next year. That being said, there were a few things that are starting to be in need of attention - the one sliding glass door has failed and let's on wind amd water; the downstairs bathroom needs some trim replaced and fixtures replaced with holes patched. " "Great vacation home, with a beautiful view. Close to the outlets and downtown Lincoln City. One of our favorites. " "We have stayed at this home several times. It's a beautiful home, very clean and well maintained. The view and deck area are wonderful. Great central location." "We were there for four nights in February. We had a wonderful time, the home is very nice and comfortable. The kitchen well equipped. Bedrooms comfortable and plenty of room. Missed having a BBQ though. Would be a nice addition!" "A wonderful house to relax and what lovely views." "This is the 3rd year in a row that we have stayed at this house. We went for 3 nights during the Newport Seafood and Wine Festival and this place was perfect for 3 couples!! Very spacious and clean and close to just about anything you want to do in Lincoln City." "We chose this property again this year for our sisters weekend. Great location and great views. The property is very comfortable and gives us our own space and a comfortable living room and kitchen." "This was a great stay! While the property had some minor cosmetic issues, it did not impact our stay! The views were magnificent!! The weather was beautiful!! We enjoyed watching the whales straight out every day with binoculars & a telescope! The last day we watched whales, seals, surfers, fishermen boats and even a bald eagle that flew by. We also enjoyed going to the beach to find rocks/agates. We had plenty of room for 8 of us. " "The photos listed don't do it justice. It's even better in person. There were three couples in our party, and there was plenty of room for everyone. The open concept dining, living and kitchen were very spacious. Everything worked and the place was very clean. This is our new beach house!!" "Awesome. Noticed the up grades , paint , new couch & chairs. We will be back??" "We are five friends who travel together and we greatly enjoyed the house, the view, the walks. Lovely place. (The pullout couch is a little lumpy!) We'll definitely return. " "My girls and family enjoyed a great stay in Lincoln City. This house easily accomodated 4 adults plus baby girl. The area was friendly for night time walking. Close beach access as well as locations to shopping. Beatiful beach views from living room and bedroom windows. " "We loved the house. The weather was wonderful, beach access is great and the hot tub is hot." "This is a great home with an amazing view of the ocean. This property far exceeded our expectations. It was a clean, comfortable, centrally located home to where we wanted to visit in Lincoln City. The hot tub on the back deck was enjoyed by all, including our seagull friend who liked to hang out on the cover when we weren't using it. We will definitely consider staying at this property again. Price was extremely reasonable and we had a wonderful time!" "Very beautiful and comfortable house, kitchen is fully equipped and the hot tub is just what you need after a long day of shopping, exploring and fun. Seen many whales right in front of the house. We had a couple of little issues but A-1 Beach Rentals was right there to fix any thing that comes up, I was very impressed with them." "Beautiful setting,beautiful accommodations, beautiful weather, beautiful people." "We were awed by the beautiful home- so stylish and comfortable. The hot tub right on the deck and overlooking the ocean was wonderful. There were 3 couples and we each had a great bed room and bathroom to ourselves. "We had a relaxing mini vacation. It was a great house. Master bedroom my favorite place in the house. Although the view from the kitchen was amazing to. I would recommend this house to family & friends. I will be back for that amazing view." "It was a beautiful home and we had a great time"
"As in years past, this was another great escape to the coast with girl friends. We love this house for many reasons, the views are fantastic, the house is well maintained and clean, it is in a quiet neighborhood, the furnishings are nice and comfy. Thanks for the new chairs and couch too." "Felt like home! We will stay again!" "This was a beautiful home that slept our 8 family members perfectly. The view was to die for and the hot tub was a hit! Would definitely book here again! " "We were very happy with how clean the place was and the great view. We had a very relaxing time - the place exceeded our expectations. " "We had a family Christmas (3 couples) this place is perfect!" "We had a wonderful time relaxing in front of the large windows and outside in the hot tub! Listening to the ocean at night was just what I needed. A huge staircase to the water would make this absolutely perfect, but the walk down the road to the beach wasn't bad at all. " "This place is terrific and I couldn't have been happier with my stay here. Very homey feel and the views are fantastic. My girlfriend loves to cook and found the kitchen to be very well stocked with whatever she needed. The beds were comfy and since we were there in December the gas fireplaces were very welcome. The house was up on a cliff which personally I liked, with beach access just down the street a bit. The property manager was very nice and accommodating. Would definitely stay here again. The place does have a lot of stairs however, in fact you have to walk up a flight when you first enter to get to the main just a heads up for anyone in which that might be a problem for." "The stay was great. House was wonderful and the views were awesome. unfortunately, that was all over shadowed our last night there when we discovered the oven didn't work. " "We had the BEST time here. The location is wonderful and the ocean is RIGHT THERE!! The house was beautiful and comfortable and very clean. Everything we needed was right there. Will definitely be coming back. We hated to leave but we left with wonderful memories." "This house is beautiful! It's in a wonderful location and the view is amazing. We had a family of 8 and there was plenty of room for all of us to sleep and hang out. I look forward to going back. The hot tub with the view was the cherry on top." "This is the third year we have stayed at this property and will be coming back again! We noticed that they updated the furniture, bedding and had painted - so very up-to-date and clean! Very comfortable for our stay and great beachfront location! Awesome views and close to shopping." "My sisters and I had a wonderful time. We had a brief break from the rain and the house was amazing. Clean and comfortable. Loved everything about it. " "Our family enjoyed our stay at Pacific Escape. The view is beautiful. We saw whales for the first time. The updated furniture and paint looks great. We will be back. " "We absolutely loved the house. It was gorgeous and impeccably clean. Views were amazing. I can't say anything bad except that due to my daughter's unfortunate hospitalization during our vacation, I was not able to spend as much time in the home as I would have liked. We only got to enjoy about 3 days vs. the five we would have liked. So we are planning on returning to the Oregon Coast again and will definitely look into renting this place again for future visits. " "The house was very clean and spacious. We loved the views and being so close to the beach. The rental price was also affordable. "Weather was ****** but we all enjoyed our three generation visit. Thank u soo much a1 for not charging all those unnecessary fees &a being so great to work with, we have been loyal customers for 12 years. Those other rental companies could learn a few things from u guys.??????????" "Took our mother for her birthday to the coast and we had a very enjoyable time. Chose Pacific Escape from the reviews and we were not disappointed. We did have one concern and that is that traffic travels quickly through the narrow road in front of the house. It is difficult to see traffic coming as there is a rise on the south side of the drivieway." "Very nice rental on Oregon Coast. Home very clean and well appointed. Worked well for our group, wives enjoyed sitting upstairs in master while guys downstairs. Well appointed and pleasant. Two MINOR issues: refrigerator ice maker dispenser broken. Could use a new fridge. Hot tub clean but water was past due changing. Suits had strong unpleasant smell after using. Also, new furniture is very nice and attractive, but not terribly comfortable." "I was very happy with the condition of the Pacific Escape property. It was very clean and the views are amazing. We were able to whale watch while drinking coffee comfortably from the view in the master bedroom. The management company was also very professional and friendly whenever I needed to contact them. One suggestion I would make is that more pictures of the beautifully decorated upstairs need to be added to the listing, I rented this place from the previous owners pictures but I am not sure I would have done the same thing from the current set of pictures. Like I said in the title, we are planning to return again within the a year. Thank you for sharing your property with our family. " "We had a wonderful vacation at this beautiful home. The interior decor was gorgeous and the outside views were stunning. The kitchen was well appointed with everything we needed to make yummy family meals and the bedrooms were tastefully decorated and we had everything we needed to create a memorable vacation at the beach. We especially loved the hot tub and used it often. Our only suggestion would be to have an outdoor BBQ on the deck. But otherwise, the house was perfect. We will definitely be back again. Many thanks to the owners and to A-1 Beach Rentals." "We enjoyed our stay and will be coming back next year!" "The main problem we had was that a house was being built across the street, so every morning (weekdays) we woke up to hammering and saws cutting wood. One of the best things about the Oregon coast is that you can sleep with your windows open because it's cool enough outside tonight heat up the house; also, with open windows you can hear the ocean when you specifically choose an oceanfront home. We were disappointed to wake up to the sound of construction work, and have to hurry to close all the windows early in the morning to reduce the noise. Otherwise the home was amazing and we truly enjoyed the sunny days and the beautiful sunsets. The home is well cared for by the a A-1 beach rentals team, as well as the maintenance, cleaning, and hot tub crews. I'm fairly certain the people who rented the home to us did not know there would be new construction--a home being framed/ built--during our stay, or they probably would have warned us and possibly gave us a lower rate for the disruption. " "Very nice house! The only thing we did not like....there was no garage door opener." "The house has amazing views! Large spacious house with plenty of room for everyone. There are a few things that need to be addressed (broken mirror door, towel hooks, Refrigerator/Freezer needs to be fixed or replaced, etc...) but our overall experience was an A+. My family loved the hot tub!" "Pacific Escape is not only beautifully decorated and furnished but had everything you might need to make you feel at home. We want to come back. The rooms are very comfortable and the master suite is a perfect escape. The location is convenient to everything, So glad we chose this unit rather than the first one we considered. The property manager was helpful too. " "This was the most beautiful beach house rental! Gorgeous view, very clean, and well decorated interior! Will definitely be back! It was a nice relaxing vacation." " We stayed in the home with two other couples for a relaxing adult only weekend! Had a wonderful time Ocean views were amazing- caught sight of many whales!" "We've stayed here several times and it never fails to amaze us. The view is just outstanding. This year we loved all the new furniture, the new paint colors and the new hot tub. It's so fun to keep coming back and watching the updates each year. See you next year!!!! " "Fun place to stay with another couple. Each had our own master areas. Cabs were easy. Food is close. " "Beautiful and will look into coming back next year, thanks!" "We came to the ocean for our annual family vacation, one of our last probably with our oldest son before he jets off to California for college. This home is beautiful! The view amazing! The decor is very well done, in fact Im in love with that dining table and chairs! The beds are very comfy and the fireplaces and hot tub are a nice addition for those chilly March nights. The master bedroom with the chairs by the big windows, was our favorite place to sit at the end of the day. A new fridge is much needed in this house, one with an ice maker and water as the one in there is pretty old. Also binoculars would be great as we saw many whales that we wouldve loved to have seen closer. Overall the house is perfect for a beach getaway! We will definitely be staying here again! " "This was our 4th year at this property and it continues to be a great place to get away! It is very quiet, clean and comfortable. Noticed that there is a new hot tub this year! The property is close to shopping, has beautiful views, and is well maintained." "The rental property met every expectation and more. The house was a perfect size for the 5 of us. It was very clean and perfectly decorated for a beach side home. Loved the living room and kitchen layout overlooking the beautiful vast ocean. The whale watching was exciting. We had one nice sunny day which made it perfect for whale watching. The hot tub was a delight too. We plan to come back next year. So far this location ranks at the top of our list of destinations for our annual getaway. The dining table was made of a nice wood but a little too tall. The height was great for scooping food right into our mouths at the right level. Haha! Other than that, I would highly recommend this location to anyone looking to soak in some of the Pacific ocean in a comfortable, clean, beautiful home." "This home is beautiful and perfect for a girl's weekend! We had so much fun enjoying the hot tub, the fireplace, meals around the island and dinner table. It was perfect for the 6 of us. The beds were super comfy and we loved every minute of our stay! The only thing that would make this the perfect place is closer beach access. " "Our weekend at this property was a perfect fit! The home was exactly what we were looking for...comfy beds, spacious living area and the view whether clear or rainy was outstanding! Whales were seen during our stay which was a treat. It fit our group of 6. We will return! Thank you. " "The house was superb, and the view of the ocean was breathtaking. I particularly enjoyed working with the staff at A-1 Beach Properties. I cant wait to return." "Beautiful, functional home away from home with a view you will love! Open, airy and filled with natural light. The hot tub and gas fireplace were like icing on a cake. We enjoyed our time immensely. " "The house was beautiful and comfortable. The view was stunning. I slept with my window open to hear the waves throughout the night. It was the perfect size for our family to enjoy each other and relax. We will rent this house again!" "This is the most beautiful house in the most beautiful location. The short walks to and from the beach were wonderful. We stood in front of the full Windows for hours chasing whale spouts. The games were excellent and the kitchen well stocked. We have little kids and big kids and it was perfect for everyone!" "Our family gathered (one came from New York City) to savor each other & enjoy the beauty of the sea~ The sun popped in and out like the whales passing by on their northern migration in the Pacific Ocean. We loved the house (luckily read "small print" & brought extra soaps, shampoo, paper towels & beach towels) & peaceful setting. Didn't realize until arrival thst Pacific Escape is on a very high cliff overlooking ocean, with remote beach access. Walking to beach is easier than uphill walk back to the house. Beds were so comfy, but we brought our own pillows ? Almost everything we needed (kitchen) was there. Double ovens (one needs some cleaning attention) helped us feed our family. We brought a bbq to cook oysters (Barnacle Bill's), ribs, artichokes, & pizza (prior consent from manager to ok bbq placed away from house/deck). The day of departure was gloriously sunny for our drive home, south along the Oregon coast. Time had passed too quickly at this lovely retreat by the sea. Our grandson, 2, already wants to "go back to the beach!" "
"A beautiful, relaxing place to stay." "We enjoyed a 5 night stay in Pacific Escape. The house has a wonderful ocean view, and plenty of room for our family. We saw several whales each day." "The house was very nice with great views! That was the second time for my children and spouses. We loved it all!" "The house was amazing, one of the nicer ones we have stayed in, it was a bit pricey because of the Holiday weekend." "Absolutely fantastic rental experience. The ease of use in reserving, paying and accessing the property set the tone for a successful stay in this amazing home." "I cannot thank Karen and the owner for allowing accommodations/requests for my father, who is on hospice. Your kindness and compassion means so much to us. The house is beautiful and the views are breathtaking. I love how close the home is to the outlet mall, beach access, and grocery store. I didn't want to leave. I was pleasantly surprised at how many items were available to use in the home, particularly in the kitchen. We all felt so comfortable and happy during our stay. Thank you from the bottom of my heart for allowing this opportunity to make memories with my dad that I will treasure forever. " "This house was beautiful with a lot of room and amazing views! " "Everything was wonderful! We loved the place and the view. The hot tub on the deck was great. " "Great home with wonderful amenities, decor and great views. Top of the line bedding and towels. FULLY stocked kitchen. Interior decorator should be commended! There were definitely some minor projects that could be tended to . . . thermostat cover off, broken stings on several window blinds, replace bulbs in master bathroom, putty up old screw and nail holes . . . all little items and could be completed for a few dollars but based on the price for 4 days, the minor repairs would definitely increase the character and charm of the house. Absolutely nothing to prevent us from renting again and IT'S ABOVE THE TSUNAMI ZONE - hope to stay for a full week next time. Diane Harvey"
"Exceeded our expectations,clean house and amazing views, very comfy bed, hot tub very appreciated,totally recommend it to anyone except those w/ little kids as the fence by cliff would not deter little explorers." "Pacific Escape is just perfect. The only apprehension I have about writing this review with a “5 star” is that it might be harder to get our vacation in coming years when more people discover this place! We have always found the customer service from these people to be excellent. They seem to truly want for your stay to be great, and are there to swallow up your concerns so it will be. About the home. Where do I start. It sits atop a bluff looking over the pacific. Picturesque is an understatement. We always have alot of things to do planned on our annual vacation, and my only regret seems to consistently be I wish I had spent more time just soaking up the beauty of the ocean right on the back deck! The home has all the amenities with modern updates, and has thr beauty, comfort, and room to offer a truly memorable stay. I usually plan my next years vacation shortly after returning from the previous trip cause we cant wait to get back! You will not be disappointed at Pacific Escape. " "Wonderfull propert clean and well kept. Dining table was a bit tall and felt like I was at the kids table hard to play board games. Hit was clean and just right. I would give top of the line reference"
"The property was in a great location and clean. very nice area. will come again. Thanks was a nice stay"
"The location of this house is perfect. You can't beat an oceanfront view! One of the reasons I rented the house is because I noticed there were two ovens in the kitchen. However, when we arrived only one of the ovens was functional. Some of the guests thought the departure checklist in regards to housekeeping was a little extensive then it should have been. For the most part, it was a great place to stay and the customer service (Karen) at A1 Rentals is excellent to work with. " Leave! This is nowcour decided annual gathering place! " "This is our new favorite place on the Oregon coast. Stunning deck with views; beautiful living area; fabulous, well-stocked kitchen overlooking the ocean. Beach access is a short walk down the hill, to a lovely, quiet stretch of beach. 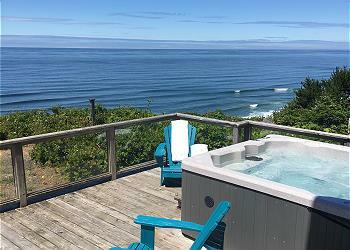 The hot tub on the deck means you can be outside even in cool weather--and whale watch from the hot tub! The master suite was stunning, and the charming second living room upstairs makes this a great option for two or three couples or a family. The property was clean and in good shape. We will be back! " "My family had a great experience staying here, while relaxing in the hot tub, we saw many whales spouting. The house is very accommodating for families. " "We enjoyed this vacation rental very much. Views were amazing. The layout of the house was perfect. The furniture was very nice and beds were very comfortable. We also really enjoyed the hot tub. We would definitely stay here again. Only a couple of things that need a little TLC; baseboards need a good cleaning as do carpets. Otherwise we loved the house." "Beautiful spot, great deck for Whale watching! Saw some each day! We brought a small charcoal bbq to cook seafood, used it one night and it was stolen the next morning-not cool! Other than that, it was a great stay!"